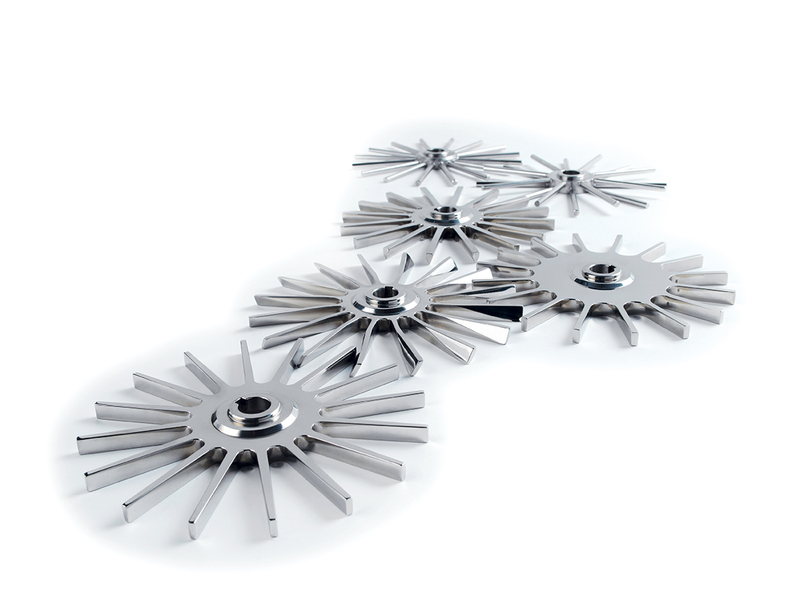 The first important step of the tableting process is product filling of the dies and dosing: the die feeder should be configured with two or three paddles whose speed is adjustable. The correct choice of feeder and paddle type is of outmost importance in guaranteeing a smooth and uniform powder flow inside the dies along with reducing the risk of segregation. There are many different available geometries of feeders and paddles, depending on the manufacturer. Standard or low feeder is usually used for pharmaceutical applications and suitable for free flowing non sticky products. Containing a limited amount of product at any given time, all the product is involved in the distribution process aided by the paddles. This kind of feeder has no “dead areas” where the products tend to dwell longer than the average. High volume feeder can contain up to several kilograms of material (depending on its density) and can be particularly suitable for products with low flowability or non-pharmaceutical applications, e.g. bouillon cubes, detergent or salt tablets manufacturing, where a high throughput is required and therefore a high dwell time is needed. Three-paddle feeder usually guarantees a more uniform flow for materials that can be described in terms of average flowability. This feeder helps to maintain a constant pressure on the feeding area, aided by the presence of the third paddle, which is located above the primary paddles. 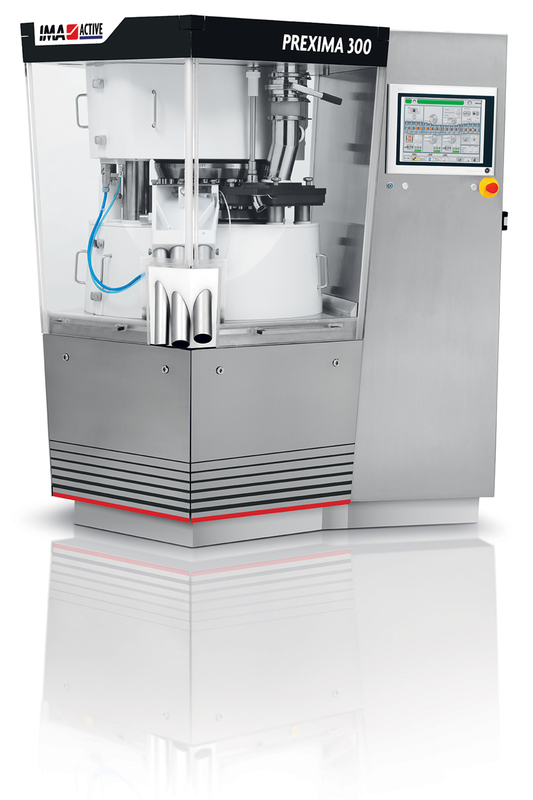 With gravity feeder there are no moving elements present, and in most applications the material movement into the dies relies on its flowability and the feeding channel cross sectional area (that can be adjusted to take into account the tablet press speed, the die size and the product flowability). Theoretically, the gravity feeder can be useful for those products that have sufficient flowability, but might present issues related to segregation or stickiness. These two conditions can be degraded with the use of feeder paddles. The above mentioned feeders, with the exception of the gravity feeder, can be equipped with different types of paddles. The choice between different profiles is a crucial feature to maximize the quality of the final product. The flat paddle profile is suitable for free flowing non-sticky blends, ensures good filling of the dies as long the materials cohesive forces remain quite low. Similar but different, flat reduced area paddles incorporate a reduced free volume between the rods. This solution can be suitable for small size tablets, where average flow of material is quite low and therefore there is no need for material to be recirculated inside the feeder. Round paddles are useful when the standard flat paddles cannot successfully feed materials that tend to show average-high cohesiveness (amount of fines, moisture content, surface structure), since the powder tends to be divided in static sectors entrapped between the paddle rods and tends to rotate with the paddles. In this case, round shaped paddle rods have a smaller contact surface area and cut better through the powder bed, instead of compacting it. In order to solve problems with agglomeration, the rods can be located on two levels in a round offset paddle profile. Flat slanted paddles are particularly useful because the powder contact surface of the paddle is slightly bent to force the powder inside the dies. These are suitable for aerated low-density products that are prone to poor flowability into the die under the combined effect of gravity/suction. This type of profile is sensitive to paddle rotation: the forced feeding effect is guaranteed as long as the slanted surface is facing the rotation direction. V-shaped paddles are very similar to the slanted profile, but the symmetry does not need to be changed if the paddle rotation is reversed.